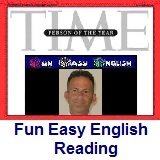 ﻿ Fun Easy English - reading practice and learning about the holiday Earth Day. In 1969 at a UNESCO Conference in San Francisco, the date proposed was March 21, 1970, the first day of spring in the northern hemisphere. This day of nature's equipoise was later sanctioned in a Proclamation signed by Secretary General U Thant at the United Nations. A month later a separate Earth Day was founded by United States Senator Gaylord Nelson as an environmental teach-in first held on April 22, 1970. Nelson was later awarded the Presidential Medal of Freedom Award in recognition of his work. While this April 22 Earth Day was focused on the United States, an organization launched by Denis Hayes, who was the original national coordinator in 1970, took it international in 1990 and organized events in 141 nations. Numerous communities celebrate Earth Week, an entire week of activities focused on environmental issues. This holiday becomes more important every year as the temperature of the planet continues to go up as a result of global warming. Please do everything you can in your country to get your elected officials to change laws to deal with problem. 1. Earth Day is which type of event? 2. Earth Day was first celebrated in which year? 3. Where was the UNESCO Conference in 1969 held? 4. Which date was proposed at the UNESCO Conference? 5. Earth Day went international in which year?